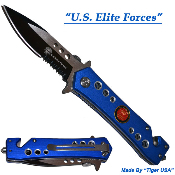 Heavy duty rescue knife featuring a two-tone black & silver blade and an aluminum handle with a US Elite Forces theme. Razor sharp 1098 (surgical steel) half serrated blade with thumb stud. Handy pocket/belt clip. Spring Assisted - Press the back to engage the spring, and it flies open and locks in place. Very high quality construction utilizing torx screws and steel components. The included razor blade seat belt cutter and all steel window breaker make this a valuable rescue tool.